You can make cute handmade cards for holidays and other occasions year round. Cards require only simple materials and some imagination. The Internet, magazines, and books offer almost unlimited ideas, designs, and even templates and patterns for cute cards. Pop-up cards, cards with pull tabs, fold-out cards, and cards with doors and windows to open can be very cute. These designs can add an element of surprise to your cards. A variety of printable pop-up card designs for all occasions are available from Robert Sabuda's website. He has cute pop-up designs for Halloween, Christmas, New Year's, and Valentine's Day, as well as other occasions. In addition, he has instructions on basic techniques for making simple pop-up cards. The Enchanted Learning web site has a number of pop-up card designs that can be made by children, including a pop-up flower garden for a Mother's Day card and a scary pop-up spider that would be wonderful for Halloween. Wiley offers the online book Unfolding the Mystery of Paper Engineering, which provides a tutorial on pop-ups, pull-tab cards, paper sculpture, and other feats of paper engineering. You can make a pop-up card with two fish kissing. When you open the card, the two fish open their mouths wide, and they share a kiss. For the card, you'll need two rectangles of card stock of the same size and contrasting colors. Assemble a quick-drying glue stick or dry adhesive and some scraps of construction or other colored paper. You'll need some markers, crayons, or paints to draw and decorate the fish. Fold both pieces of card stock in half horizontally. Set aside one card for the outside and hold the inside card with the fold on the left. You can draw two fish, or you can use an appliqué paper fish on the card. 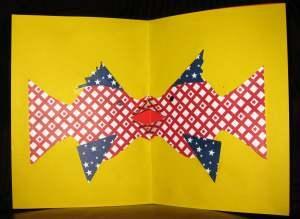 To use the paper appliqué method, fold a rectangle of paper in half, and cut a fish with the mouth of the fold. Do not cut the two fish apart. They will be facing each other. Glue the fish to the card, and let the glue dry before taking the next step. Approximately half-way down the fold, cut a slit for the mouths of the two fish. With the card folded, fold each flap made by the slit into a right triangle. Open the card and push the triangles forward to make connected mouths for your fish. Glue the card with the slit inside the other card. The inside of the fishes' mouths will be the color of the outside cardstock. To finish the fish, you can glue on scales from paper or sequins. You can add bubbles or seaweed to the background. Write a greeting on the card. For example, you could write "Fishing you…" on the front of the card, and "a Happy Birthday" on the inside of the card. Everyone enjoys receiving cute handmade cards. It may take a bit of time to make each card, but the recipient will have an original keepsake, and you'll have the pleasure of using your creativity and imagination to make a birthdays, holidays, or other events memorable.